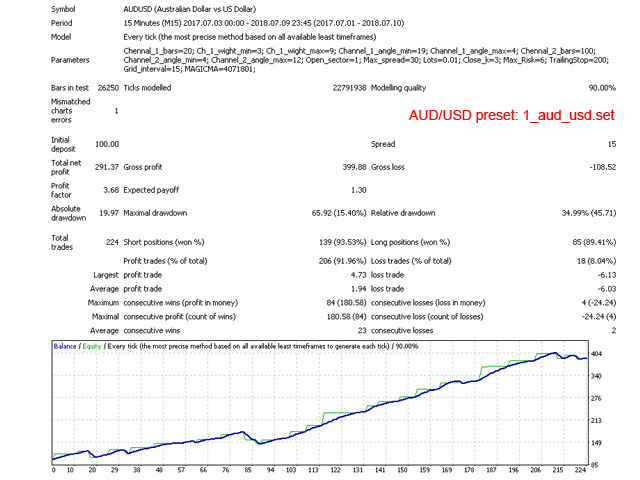 Dual channel EA is an automatic trading system. The EA trades within two price channels calculated on different timeframes. Certain combinations of their parameters (width, inclination angle, direction) serve as a signal for opening/closing deals. Since there can be several such combinations, the Expert Advisor can be used with different settings on one or several currency pairs simultaneously. Take Profit is set at the lower (sell) or upper (buy) boundary of the channel. If the price continues active movement in the direction of the order, the EA moves Take Profit to get more profit. The EA does not set stop loss when opening a deal, however, it uses TrailingStop. The EA can open a grid of orders in one direction if all the previous orders are profitable and the current price is greater (buy) or less (sell) than the order opening price by the number of points specified in Grid_interval. A deliberately high value of Grid_interval will prevent the EA from opening a grid of orders. 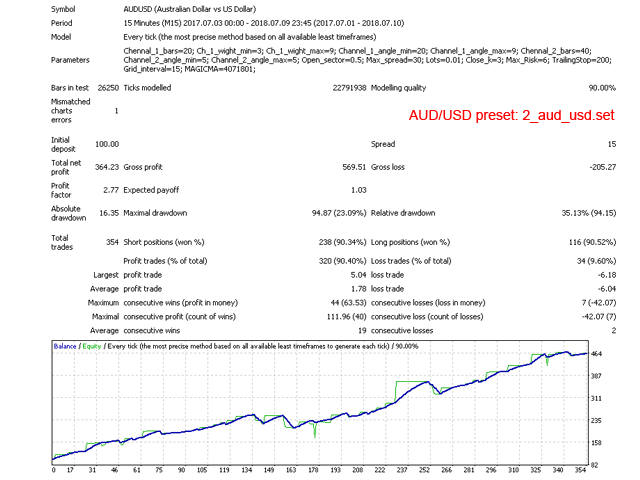 By stop loss, set automatically depending on the TrailingStop settings. At a reversal of both channels or just one of them. 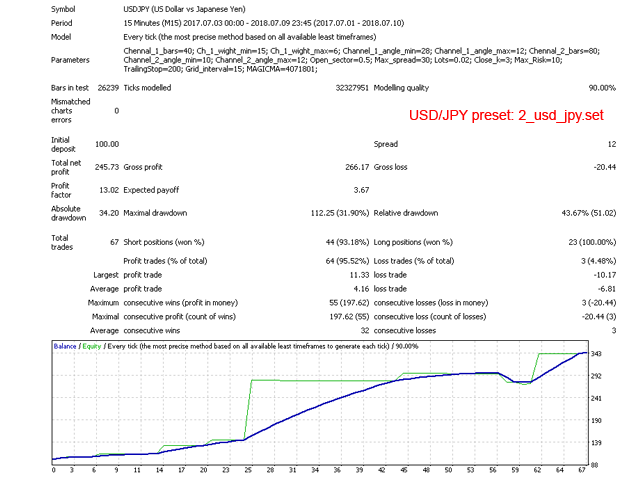 When the order reaches the maximum loss level, defined in Max_Risk. The default settings are not optimized! Do not use them when testing and trading! Width and inclination angle of channels are not set in points and degrees. They are calculated according to the expert's internal formula with additional coefficients. During testing and configuration, please pay attention to recommendations. Channel_1_bars - the number of bars to calculate the first channel. For currency pairs, 20 to 120 is recommended. Test with a step from 10 to 20. Ch_1_wight_min - the minimum width of the first channel. For currency pairs, 0 to 30 is recommended. Test with a step from 2 to 5. Ch_1_wight_max - the maximum distance from the lower to the upper boundary of the first channel. For currency pairs, 0 to 15 is recommended. Test with a step from 2 to 5. Channel_1_angle_min - the minimum inclination angle of the first channel. For currency pairs, 0 to 30 is recommended. Test with a step from 2 to 5. Channel_1_angle_max - the maximum inclination angle of the first channel. For currency pairs, 0 to 15 is recommended. Test with a step from 2 to 5. Channel_2_bars - the number of bars to calculate the second channel. For currency pairs, 20 to 120 is recommended. Test with a step from 10 to 20. Channel_2_angle_min - the minimum inclination angle of the second channel. For currency pairs, 0 to 30 is recommended. Test with a step from 2 to 5. Channel_2_angle_max - the maximum inclination angle of the second channel. For currency pairs, 0 to 15 is recommended. Test with a step from 2 to 5. Open_sector - channel sector where the current price for opening orders should be located. For example, if set to 2, it is the upper (sell) or lower (buy) half of the channel. For currency pairs, 0.5 to 5 is recommended. Test with a step of 0.5. 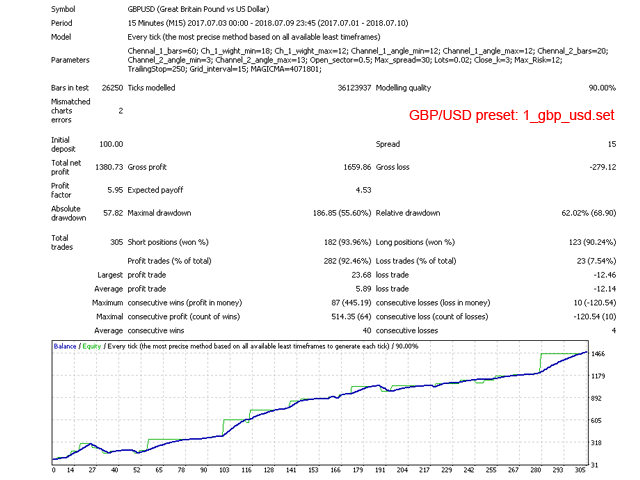 Max_spread - the maximum spread. Close_k - close deals at a reversal of one of the channels. Suitable values are from 0 to 3. 3 - do not close deals at channel reversals. 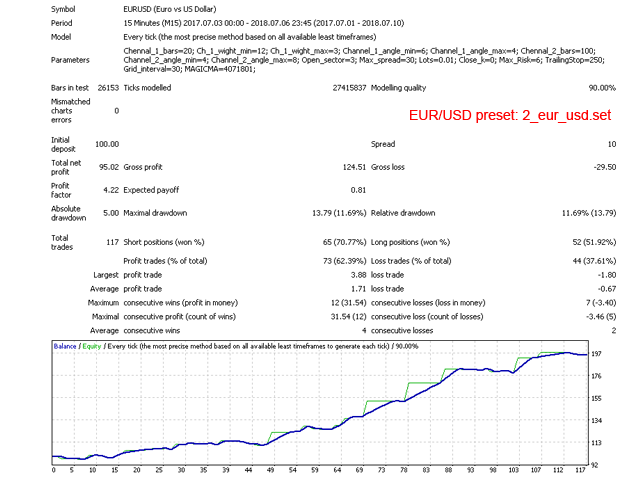 Max_Risk - the maximum loss of a single order in the deposit currency. 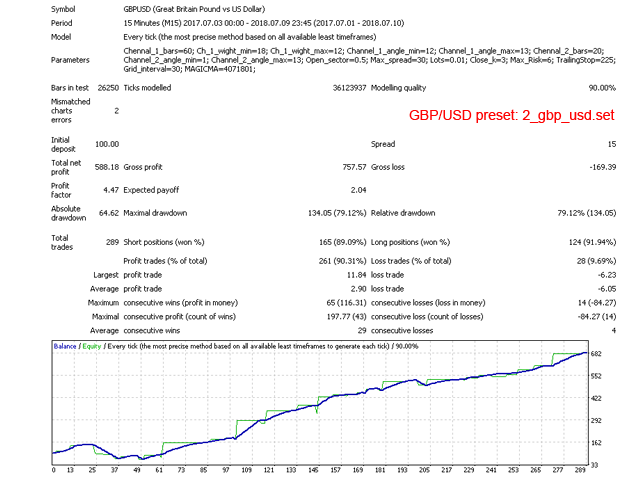 Grid_interval - interval in points for grid trading.